Old pipes? A vintage airplane? Mechanical equipment? Ben Burtt, Hollywood’s master sound designer, is remarkable for his economy and resourcefulness. That’s evident in this charming video in which he demonstrates how he evoked breaking machinery to realize the sound of the Millenium Falcon… not going into hyperdrive. So, how to make cues that would be recognizable and resonant for an audience, but without sounding like a World War II movie sound effect had been dubbed over fantastic science fiction? The answer: clever layering and re-contextualization. Once combined with John Williams’ score, plus the combined delivery of Harrison Ford and the movie action itself, the cue is perfect. Here’s a 10-minute documentary for more juicy Burtt action. A sound you know from childhood – and what it can teach you about sound design and composition. That should keep you occupied for a few hours. Or… years. 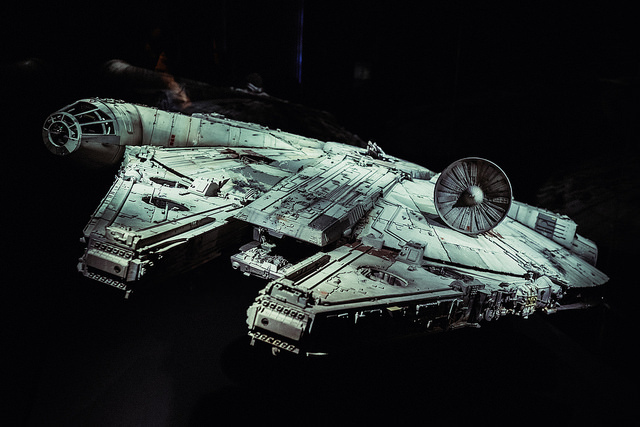 Millennium Falcon image here (CC-BY) Kory Westerhold.